“When I was a boy, I was afraid of the dark... What was there”. As part of the du Maurier World Stage Festival, Harbourfront Centre presented a staged reading of Shakespeare’s “Edward III”. I would not ordinarily review a staged reading, but this was not an ordinary occasion. It was the first staged reading of the full text of “Edward III” in Canada. On September 27, 1998, the London Times reported that the editors of the Arden Shakespeare, convinced by the results of the latest computer-aided textual research, had decided to include this formerly anonymous work in their new edition as Shakespeare’s 39th play. In October 1998, three days after the play received the Arden imprimatur, an actor at Shakespeare by the Sea read excerpts of the play to an audience, playing all the parts, to claim for himself the honour of giving this “new” play by Shakespeare its first performance in Canada. While that may have been the first public reading in Canada of excerpts from the play, the full text was not read and few people would claim that it was a staged reading, implying that roles are played by several actors who have rehearsed their parts and their movement on stage. The du Maurier World Stage programme had announced that the Soulpepper Theatre Company would present the play in honour of Shakespeare’s birthday and that Robin Phillips would direct. That is not what occurred. Phillips and Soulpepper were still preoccupied with fine-tuning their production of “The Mill on the Floss” and bowed out of the project. At that point, Don Shipley, Artistic Director of the World Stage, phoned Peter Van Wart to see if he could rescue the project. Van Wart and Rosemary Dunsmore, who became the new director, hand-picked a group of 13 actors to play the more than 50 parts. The result was a resounding success and a vindication of the play’s right to be included in the Shakespeare canon. It was exciting to be witness to this historic occasion. According to Giorgio Melchiori, editor of the play for the Cambridge Shakespeare, the play dates from late 1592 or early 1593. That would place it in the same range as “Richard III”, “The Comedy of Errors” and “The Taming of the Shrew”. Of all of Shakespeare’s plays, “Edward III” has the most in common with “Henry V” seven years later. In both a hero-king ridicules the Salic Law of France, claims his right to be the King of France, invades and triumphs. In both plays an entire act is taken up with a love scene between the king and a noblewoman. The nature and placement of that love scene within the action, however, is very different. In “Henry V” the king first conquers France and then in Act V must conquer the hand of Katherine to secure his rule. In “Edward III” the king, already married, falls in love with the Countess of Salisbury, also already married. His obsession with this illicit love threatens to ruin his campaign against France and to ruin his own reputation, showing him to be a tyrant and hardly the ideal of a magnanimous ruler. In a series of encounters that look directly forward to the scenes between Angelo and Isabel in “Measure for Measure”, Edward becomes so enamoured that he is willing to abuse his power as king to obtain his desire. Only through the eloquent pleading of the Countess and her threat to kill herself is the king brought back to his better nature. Thus, Edward has to conquer himself to be fit to conquer his foes. Unlike Henry V, whose son is only mentioned in the Chorus’s last words, much of the second half of “Edward III” concerns Edward’s relations with his son Edward “The Black Prince” and his introduction to and mastery of warfare. 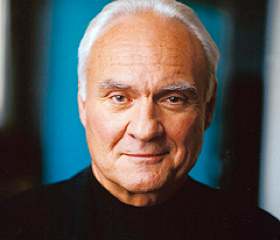 Peter Van Wart’s greatest casting coup was to have Kenneth Welsh play the title role. One could not have thought of a better choice. Welsh’s power and complete mastery of the verse convinced us again and again that this was indeed Shakespeare’s work. But forcefulness in a warrior can be misdirected as we see later in “Othello”. Where Othello is tempted to jealousy, Edward is tempted to an unlawful love. Welsh’s scenes with Rosemary Dunsmore as the Countess of Salisbury were the high point of the reading. Welsh’s Edward slides into his abuse of power willing himself not to know what he is doing and still knowing he is doing wrong. Dunsmore was excellent as a woman who must use all the persuasive powers of reason to turn her king back to the right path. The rest of the cast was also very fine, all of them, except Welsh, having to play multiple roles. I was slow to warm to Alex Poch Goldin as the Black Prince, but as the reading continued he seemed to become more involved in his role and delivered his Hamlet-like speech accepting death whenever it may come with eloquence. Among the older actors, Graham Harley stood out in the role of Lord Audley, the Prince’s mentor who teaches him how to ready himself for death and later must confront death himself. John Gilbert was most effective in the role of Warwick, the Countess’s father who has the unenviable role of trying to persuade his daughter, against his own wishes, to give in to the king’s lust. Patrick Galligan showed a facility for speaking verse in the roles of Lorraine and Salisbury, the Countess’s husband, but did little to distinguish the two. Among the minor characters, Peter Van Wart well captured the French King John’s nature as befuddled and over-credulous without making him a caricature as so often happens with the French king in “Henry V”. John Ralston, as his elder son Charles, and Mathew Edison, as his youngest son Philip, were both excellent, Ralston especially so in the scene where Charles upbraids his father for breaking an oath made to him. Unlike in “Henry V”, Shakespeare is willing to show that the French, too, have a moral conscience. Satire is reserved for the Scottish King David (Oliver Becker), the King of Bohemia (Jan Filips) fighting for the French, both of whom made much of their appropriate accents, and for Lodowick, Edward III’s secretary (Keith Knight). The scene where Edward asks Lodowick to write a love poem for him came off as the most humorous in the play. Christine Moynihan was also excellent in her two roles as the Mariner who describes the Armada-like destruction of the French fleet to King John and as Philippa, King Edward’s wife, who reacts strongly to the (false) report of her son’s death. Musicians Marisa and Ernesto Cervini skillfully used keyboard, flute, clarinet, trumpet and drums to set moods or underscore themes throughout the play. In June last year the Cleveland Shakespeare Festival presented what it called the first fully staged production of “Edward III” in the eastern United States. (The play had been done in Los Angeles in 1986 when when the author was still “Anonymous”.) In Canada, the most likely place to look for a full production would be the Stratford Festival. After all, how often is a new play added to the canon of the world’s greatest playwright? Stratford, however, has shown little interest in performing the full canon even as previously constituted. “Henry IV, Part 1” was last done there in 1984 and “Henry IV, Part 2” in 1979. The Henry VI plays have not been seen since 1980. Artistic Director, Richard Monette, has been quoted in print more than once expressing his lack of interest in Shakespeare’s Histories or “all those plays that end in numbers” as he calls them. Rather an unfortunate view, I’d say, since those plays make up almost a third of Shakespeare’s output. And now there is one more. We can, thus, only hope that the success of the reading on Easter Sunday will spur some adventurous group to take up the challenge and bring this work, so full of ideas Shakespeare would use again in different contexts, to an even larger audience.